Probably the best thing about traveling is coming home. Nothing excites me more than planning a trip — making reservations, packing a bag and hitting the road. But every time we drive down that long dirt driveway, dodging rabbits, pot holes and deer, my heart warms and happiness fills me. We don’t have to be home for long when we get the itch and start planning another trip. This time we were home for about three days. The conversation always goes something like this: Barnaby waits until I’ve had at least one cup of coffee then says “I know we just got home from a trip, but its been a long time since we’ve been on a car trip. How about in three weeks we …..”. In the meantime, I clean up my desk, try to catch up on chores, and more importantly — do a lot of socializing. This past weekend was especially social because of the Easter holiday. I have always wanted to attend a Passover Seder. Even though I have a lot of good friends that happen to be Jewish, I’ve never managed to get an invitation, and believe me — I’ve begged! The big Idyllwild Seder is so full even the Jews can’t always count on getting in. So this year, before we left for Italy, I went to my can-do friend Elaine and asked if she could help. “Of course we can have a Seder! No problem. Louie and Vic can do all the cooking, Louise will bring the Manischewitz, and Summer will bring chickens and root vegetables. We’ll have matzo ball soup, gefilte fish (my dreams are coming true), pot roast — it be will a Kosher smorgasbord”. And it was. We were a little unorthodox with the timing since we had it on Saturday night long after the beginning of Passover, but it was delightful. My dear friends, though Jewish, were a little rusty with the ritual and had to constantly refer to their Passover Haggadah (that’s the manual for the Seder). Lou recited the prayers in Yiddish, Vic in Hebrew, and Summer in French while the rest of us waited for Louise to translate. We had so much fun we decided to make the Saturday Night Seder a tradition. On Sunday, we had a more traditional Easter feast starting with lots of colored eggs, chocolate and champagne. My sister Lorna has a new cat named Tyson. He was adopted and came with that name and since he’s a big boy we figured he was named after the boxer. 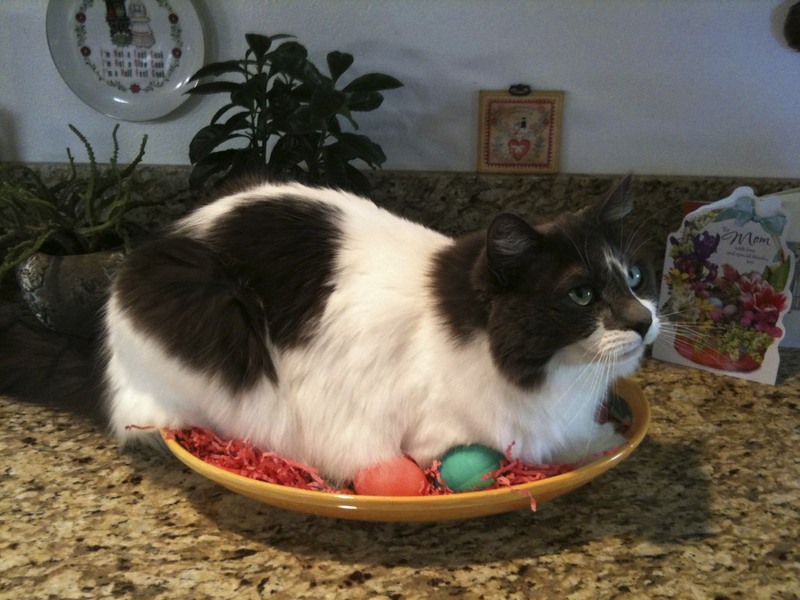 But he spent most of the day laying on the Easter eggs, we decided he was probably a chicken in his last life. On Sunday afternoon we were shaken by the biggest earthquake I think I’ve ever felt — a 7.3 centered in Mexico just south of our Palm Desert locale. Although it seemed to last forever, the only damage was to Lorna’s nerves. That brings me to the love affair. You might think that after almost 3 years I would be getting used to my iPhone. But it continues to amaze and entertain me. My latest and favorite aps are Pano and Hipstamatic. Both are camera aps and both better to see than hear about. This first one was taken on Easter at my mom’s with the ap Pano. That’s Summer and Mike talking to Barnaby. Lorna is in the kitchen making a feast. Not sure where my mom is at this point. Pano makes panoramas using your iPhone camera. 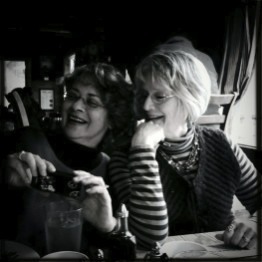 Then Monday, I met the crazy girls at Aroma for lunch and more iPhone fun. This next one was taken using the ap Hipstamatic. You can pick from several different lens and film options to make images that resemble old Instamatic shots. This is Debbie and Karen. We’re all having love affairs with our iPhones. They didn’t know I was taking their picture or Debbie would have made a face, and it probably wouldn’t be pretty. I’ll sign off for now, but I have to include one more photo from the Pano ap. It’s a little frightening, but I think it really sums up where those lunches can go at times. This entry was posted on Wednesday, April 7th, 2010 at 1:07 am	and posted in Uncategorized. You can follow any responses to this entry through the RSS 2.0 feed. Loved the thoughts about your Seder. We had a Seder last Saturday down here in the flats with some friends. It was wonderful reconnecting with my 1/4 Jewish heritage. Actually made me cry a bit. Did you do any of the readings? They are actually quite beautiful and really humanistic.